Today, Mitch McConnell blocked a vote in the Senate on a resolution calling for special counsel Robert Mueller's report to be released to the public, marking the 2nd time in just 48 hours that McConnell has prevented the legislation from moving forward. What is Mitch so afraid of? What does he think is in Mueller's report that he is so desperate to hide it from the American people? This resolution unanimously passed the House earlier this month by a vote of 420 to 0. But Mitch McConnell won't even allow the Senate to bring the bill to the floor to be considered. Enough is enough! Mitch McConnell is up for reelection in 2020; if you think it's time for Mitch to go, then make a donation right now to help us support his future Democratic opponent and Ditch Mitch next November. Every dollar you give today will go directly to defeating Mitch McConnell and finally ending his political career. We started Ditch Mitch, a completely grassroots organization solely dedicated to defeating Mitch McConnell, because of partisan games like this. We remember how Mitch tried to cut and privatize our Social Security and Medicare. We remember how he sided again and again with the NRA, Big Oil, Big Pharma, and Wall Street. And boy oh boy! Do we remember the two opposite tactical situations he employed regarding Merrick Garland and Brett Kavanaugh. That's why we're building a grassroots movement to defeat Mitch McConnell in 2020. Over 14,000 everyday people have already given and joined our movement to Ditch Mitch, and we're asking if you'll join us today by making a donation of your own. Help us send a message to Mitch McConnell that we won't stand for his obstructionism any longer by making a donation right now of whatever you can afford to Ditch Mitch. Every dollar you give will go directly to help us hold Mitch accountable, support his future Democratic opponent, and ensure McConnell never wins another election again. Together we will grow our movement large enough to defeat Mitch McConnell next year. Yesterday, McConnell took to the Senate floor and blocked the first vote on a resolution for special counsel Robert Mueller's report to be released to the public. 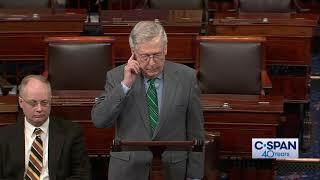 Despite the fact that the measure passed earlier this month in the House by a unanimous vote of 420-0, Mitch McConnell is now refusing to allow a vote in the Senate because he knows it would pass with overwhelming bipartisan support. Should we really be surprised? This is no different than when Mitch refused to allow a vote on a bipartisan bill protecting Mueller's investigation in the first place. When Mitch blocked a vote on HR1 the bill passed by the House to make it easier to vote: when he refused to allow a vote to reopen the government during Trump's month-long shutdown. If there were truly 'no collusion,' if this entire thing were just a 'witch hunt,' then there should be no reason that Mueller's report shouldn't be released. Even Donald Trump said yesterday that it "wouldn't bother him at all" if the report were to be released in full. Deep down, what Mitch McConnell fears most is US. Mitch is the most unpopular senator in the entire country; he knows he's vulnerable enough that he could lose. Even in ruby red Kentucky, our most recent poll from last month shows that McConnell is only ahead 3 percentage points in a head-to-head match-up against a Democrat. I like the spirit behind this effort very much. I think McConnell opponents have a real chance, depending on which Democrat can run against McConnell. Amy McGrath and Steven Cox seem to be the leading potential opponents, at this point.